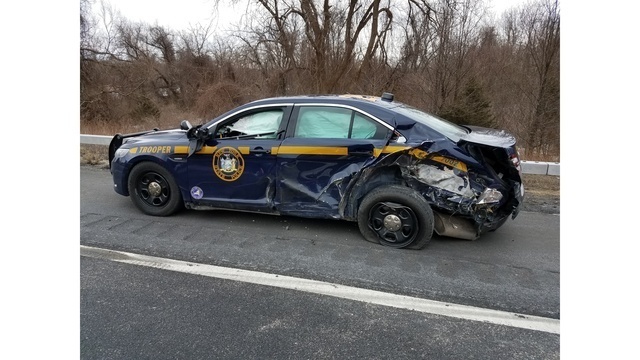 KINGSTON, N.Y. (NEWS10) - New York State Police ticketed a driver they say failed to move over and struck a patrol car on I-87 northbound in Kingston Wednesday afternoon. 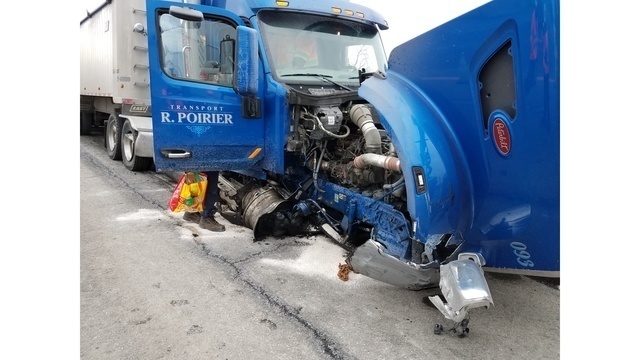 Police say a trooper was assisting a disabled motorist when Michael Audit, 54, of Napierville, Quebec, who was operating a tractor-trailer, struck the driver's side of the patrol car. Audit is then accused of continuing north, striking the driver's side of the disabled vehicle. Both occupants, at the time, were changing a tire. The tractor-trailer then struck the guide rail, crossed over the northbound lanes, and stopped on the westbound shoulder. A passenger of the disabled vehicles was injured when the tractor-trailer struck her and pushed her into the guide rail. The driver of the disabled vehicle was able to jump over the guide rail and was not injured. The trooper and the passenger were transported to the hospital with non-life threatening injuries and were released. Audit was not injured and was given a ticket for moving lane unsafely and violating the Move Over Law. Police say the New York State Department of Environmental Conservation responded to the scene for a spill response due to fuel leaking into the Esopus Creek.